The Home Office could face legal action over its failure to explain the "Request Filter" system buried in its Communications Data Bill. That's the draft law that allows spooks and cops to massively ramp up surveillance of British citizens online. Critics have already lambasted the cryptically named “Request Filter” agency, which will take orders from the police and other public bodies to extract communications data – the information revealing “who is in contact with whom”. Some have argued that it is simply a database by another name. Now the UK's data regulator has issued an Information Notice requesting details relating to Home Secretary Theresa May's proposed law. "The notice is in connection with an ongoing freedom of information complaint currently being handled by our office," a spokesman at the Information Commissioner's Office told The Register. He added: "The Home Office now has 30 working days to provide our office with the details we have requested. We will then examine the material before deciding whether the information requested by the complainant should be disclosed." Tory MP Dominic Raab submitted a Freedom of Information request last summer, the Telegraph reported. However, the Home Office has cited "national security" concerns for the reason why May's department has declined to disclose the information requested by the MP. “This far-reaching scheme could drain the swamp of every email, text message and phone call made by every citizen, a tectonic shift in the relationship between the citizen and the state," Raab told the newspaper. "So, it's astonishing that Home Office bureaucrats are risking contempt of court by trying to cover up the most basic information on how the scheme will operate in practice." Last week, May repeated to MPs on the home affairs committee that her department had "accepted the substance of the full recommendations" put forward by the panel - which concluded in December 2012 that the so-called Snooper's Charter was "too sweeping", "misleading" and "suspicious". It was revealed in February that, since May 2010, the Home Office had spent £405m on its communications capabilities development programme (CCDP). The Home Secretary - when quizzed last week about what that taxpayer money had paid for so far - fuzzily explained to the committee that it covered "looking at the technology and so forth that has been necessary in terms of developing what we would be able to do under the communications data bill." 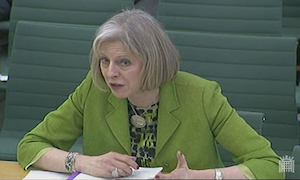 Theresa May faces home affairs committee. Separately, the Times reported this morning that computer security experts had written a letter to the Prime Minister urging him to ditch May's draft bill - claiming the plans were "technically dangerous" and "naive". The academics argued that the government was trying to crudely "foist" the system designed for landline phones on to its plans to increase surveillance of internet activity in the UK. The Home Office repeated today that its widely criticised bill was "vital" to help police and spooks catch paedophiles, terrorists and other serious criminals. "The proposed request filter will further protect privacy by discarding all data not directly relevant to an investigation," a spokesman at May's department said in response to the ICO's notice.